Ask and ye shall receive, apparently. Just as I was getting worried that the show starring Rachael Ray and Guy Fieri was going to be a no go, the Food Network's blog, The FN Dish, provides some details and an air date. As we already knew, Guy and Rachael will each have a team of celebrities, who will compete in cooking challenges. 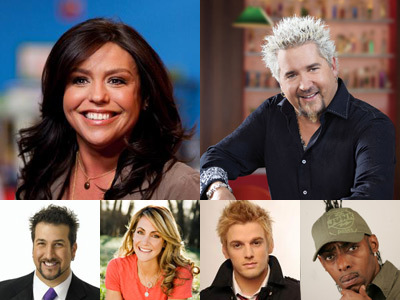 The show will air on the Food Network on January 1 and 9pm, with these stars: Summer Sanders, Lou Diamond Phillips, Aaron Carter, Taylor Dayne, Coolio, Cheech Marin, and Alyssa Campanella. Certainly not an a-list crew, but I will be rooting for Joey Fatone in honor of my never ending love for NSYNC. Don't judge.